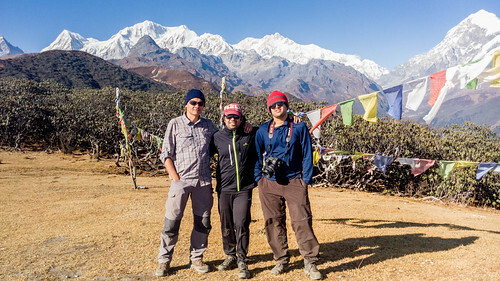 Me and some friends decided to trek to Goecha La, a high altitude pass (elevation 16,207') in West Sikkim, in late November 2015. 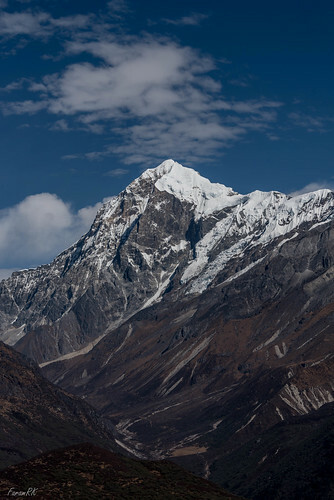 This pass is 7 km, as the crow flies, from the base of the south face of Kangchenjunga. This was a fully managed trek i.e. support staff, pack animals, food, water and camping gear were arranged by the trek organizer. 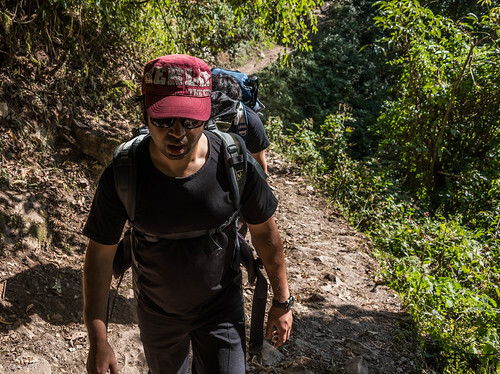 Trekking 'Sahib style'! We flew into Bagdogra (VEBD), the nearest airport for accessing North Bengal and Sikkim. We were received by the trek organizer, 'DK' and drove to nearby Siliguri to get some paper work done and buy some provisions. We had lunch then drove to the trail head, Yuksom in West Sikkim, 144 km to the north. 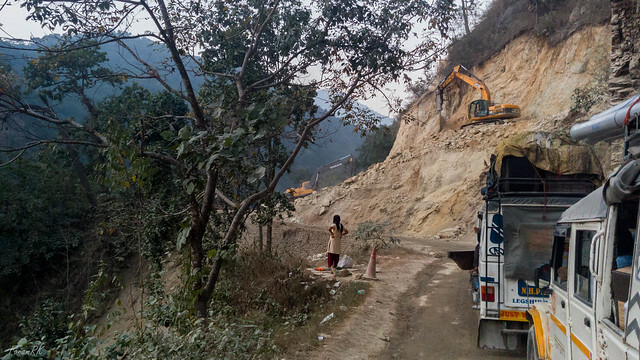 We drove north, along the Teesta on our right, all the way to the base of Kalimpong hill. At Teesta Bazaar we crossed over to the Kalimpong side of the river for a short stretch to Melli. At Melli, we once again crossed the Teesta to its north bank. We had now left West Bengal and entered Sikkim. 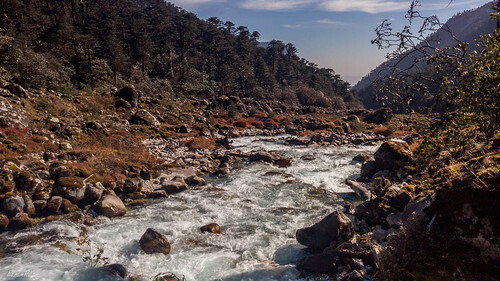 Now we drove along the second major river of Sikkim, the Rangeet and there were some very scenic sections with a narrow gorge carved by the river. The road between Melli and Jorethang, the next major town on the route, was quite bad due to roadworks. By the time we reached Jorethang, it was nearly an hour after sunset. We took a short tea break to stretch our legs and to withdraw some cash, as it seemed there were no ATMs farther on. A bit before we reached Tashiding, we stopped following the Rangeet and started climbing up the hill. We finally reached our hotel in Yuksom (5,840') , in time for dinner. We woke up to a crisp, clear day and could see Kabru (24,318') at the head of the valley, to the north. After breakfast, we met our guide 'LH'. Many people here like to be addressed by their initials. It stood for LokHang, which meant 'king/leader of the people'. Obviously, we were in good hands! We started off for Yuksom CP (Check Post) to attend to the first order of business - getting our papers checked. You're not on a real trek without some red tape to start you off. After that, we paid our respects at KNP (Kanchenjunga National Park) CP for some more permit related formalities, after which we were free to proceed as we pleased. 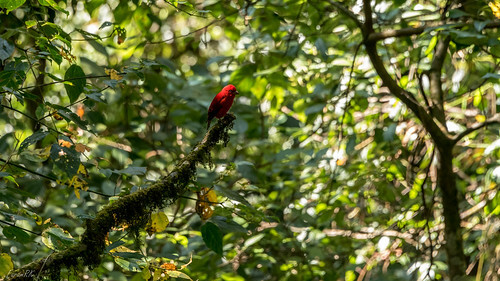 The trail passed through lush green jungle. We had a delicious lunch and also had the opportunity to meet our chef, Sanman and his staff of helpers/porters. Our five pack-ponies and their handler (aka 'horseman') had already departed on their way to Tshoka. By the way, there's extremely patchy mobile phone signal reception after Yuksom, and none after Tshoka. So one is cut off from the outside world for the duration of the trek. The main reason why I carried my mobile phone was to take GPS fixes at notable points along the route. After lunch, we restarted our hike and nearly an hour later crossed the Prek Chu to reach the base of a hill on the other side. This section was quite steep with an average slope of 40°, a continuous tiring climb of 2,500 feet. We reached Bakhim (8,740') at 16:30. Soon it would be dark. There is an earthquake damaged building there that is used as a transit stop by students of HMI (Himalayan Mountaineering Institute). A bit later one of our party needed to stop due to exhaustion. After distributing his pack amongst us, we continued up the trail in the dark. Unfortunately, I had left my headlamp in my duffel bag, which had gone on ahead on one of the pack ponies. I had my hand-cranked mini-torch, but it wasn't too bright. We reached Tshoka (9,710') camp site in the dark at 17:45. 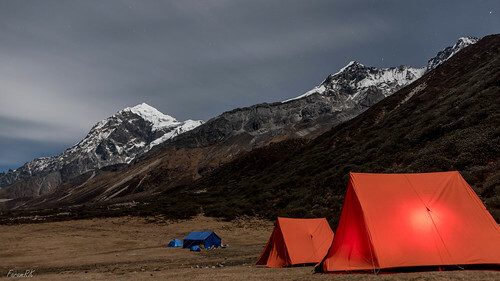 Our crew had already pitched our tents, and after an early dinner, we were ready to call it a day. The outside air temperature on arrival was 5°C while it was 5°C to 8°C inside the tent. We woke up to another crisp and clear morning. In keeping with our royal style of travelling, we started the day with bed tea served in the tent! After which we were given a bowl of warm water for our ablutions. 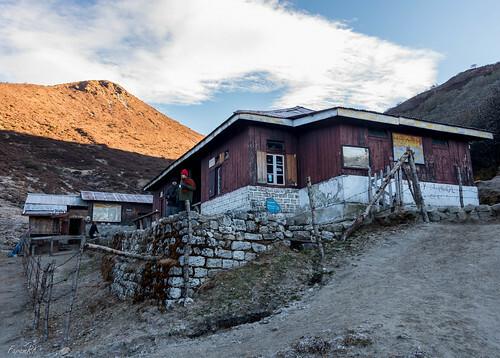 Tshoka consists of a couple of trekkers huts and many dilapidated empty houses. Tshoka was a small village which was later evacuated and its inhabitants relocated outside KNP. 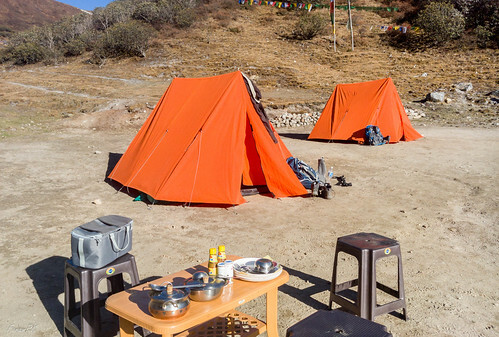 Now a days its only use is as a camp site for trekkers. I'm not sure where they got the water from as I didn't spot any source. After a filling breakfast, we were back on the trail at 08:30. It would be another day of climbs, with some steep slopes up to 40° interspersed with relatively flat sections. We were now travelling on the ridge and the trees were thinning out as we ascended. In fact if we traveled on this ridge for a sufficient distance we would reach Kabru and thence Kangchenjunga summit! Some sections were tiring and we often needed to take a break. We reached Phedang (12,080'), a flat spot on the ridge, in time for an early lunch. Phedang has a solitary kitchen hut. 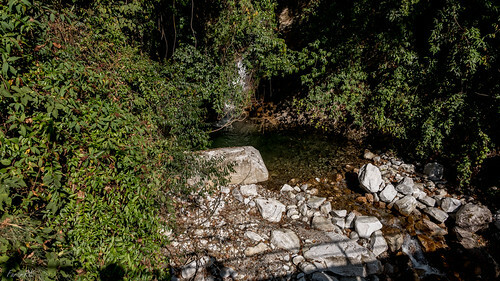 Its not used as a camp site because the nearest water source is a few hundred feet below. 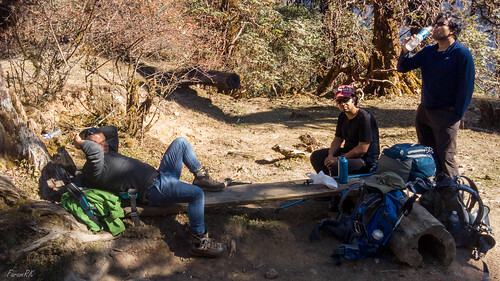 Our band of conjurors had produced a first class lunch, so after stocking up on the calories, we resumed the climb to Deorali, the highest point on this leg. We reached Deorali (13,100') at 14:00. 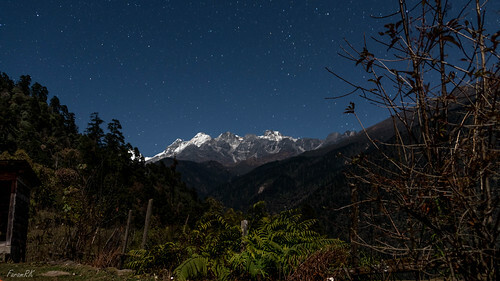 It is one of two local maxima (the other being Dzongri Top) on the ridge near Dzongri, and one gets a panoramic view of most of the prominent peaks in the eastern Himalayas around Kanchenjunga. 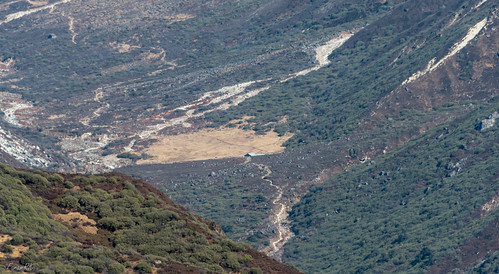 At this altitude, the vegetation had changed from trees to rhododendron and juniper bushes. From Deorali, there was a gradual descent to Dzongri. Soon we left the ridge line and traversed down the western side of the ridge towards Dzongri, less than a kilometre away. Unfortunately, a member of our party started feeling the altitude and had perceptibly slowed down. We passed a frozen stream then reached Dzongri (13,040') at 15:20. On reaching Dzongri, we found our tents pitched (nothing new there) and each duffel bag placed neatly beside. After evening high tea sat around our portable 'dining system', we lounged around the camp site. 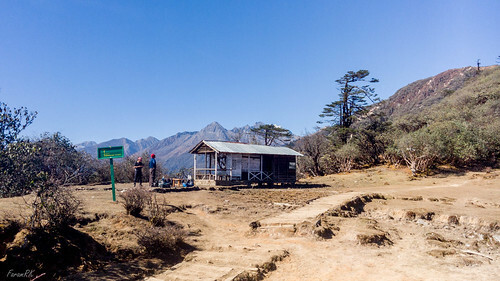 Dzongri has a trekkers hut along with another smaller hut occupied by the camp site's caretaker. His wife also ran a very small shop, selling small items (wool caps, toffees, etc). There was a semi-frozen stream that ran through the camp site. After dinner in the cold trekkers hut and a bit of socializing with a solo trekker, we retired to our respective sleeping bags. It was -1°C at 19:30 inside the tent. Late at night there was a very light drizzle. Due to the 3,000+ feet ascent above10,000 feet elevation the previous day, this day was reserved as an acclimatization day i.e. 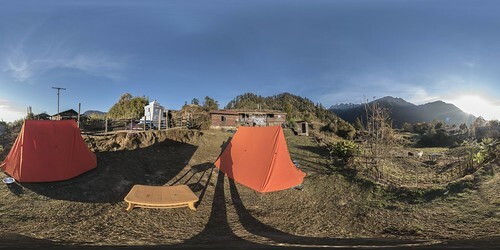 ascend to local higher elevations to aid acclimatization then return to the same camp/elevation to sleep, to help the body adjust to the altitude. 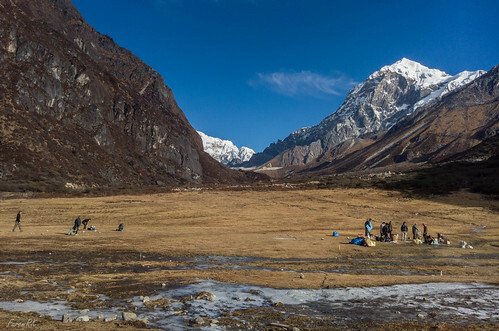 We could just as well have trekked to the next camp site, Thangsing, which was at almost the same elevation. But view points near Dzongri had panoramic views of the Himalayan peaks while Thangsing was hemmed inside a valley. It was another sunny morning, but quite chilly ( -5°C at 07:00). 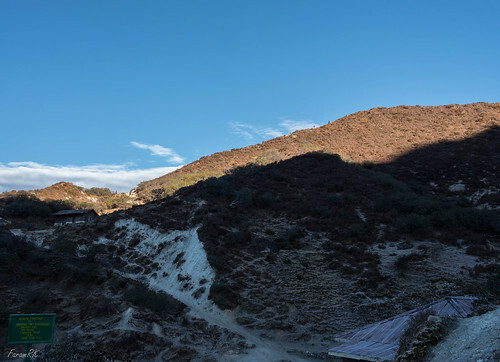 As Dzongri is located in a hollow on the western side of the ridge, it takes some time for the sun to get high enough to dispel the shadows and warm up the area. 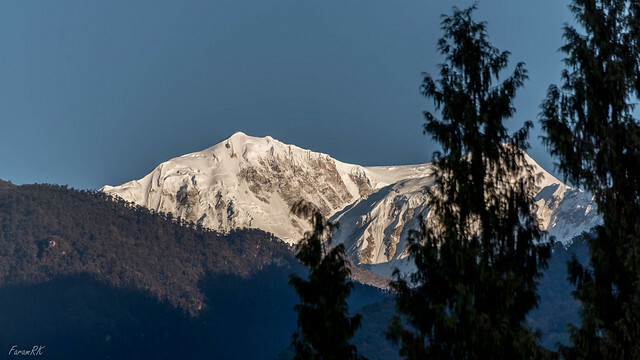 Most trekkers get up before dawn to hike to the top of a nearby view point 'Dzongri Top', to see the morning sun rays hit the Himalayan peaks. But we decided to take it easy and go there after breakfast. It was a 35 minute hike to Dzongri Top (13,570'). From the top we could see a vast panorama of peaks arrayed in front of us from Kangla Khang in the west to Narsing in the east. Kanchenjunga was dead ahead to the north. Unfortunately its summit was wreathed in clouds. The view was dominated by Kabru (24,318') in the NW quadrant and Pandim (21,952') in the NE quadrant. We could also see Thangsing, our destination for the next day, in the distance across the Prek Chu valley. After spending an hour at the top, we descended the northern side of the hillock then hiked up to Lakshmi Pokhri (13,660') , a pond near the south east flank of Kabur (15,652'). 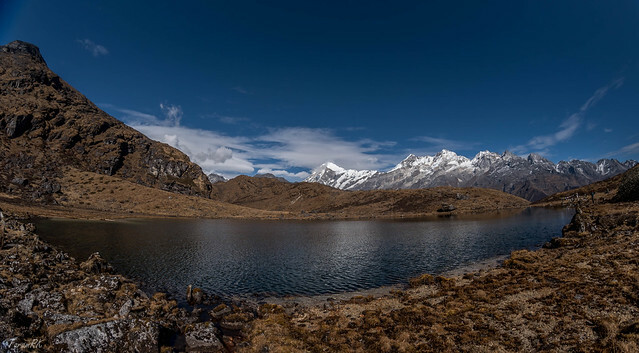 The crystal clear waters of the pond and its backdrop of Himalayan peaks under a deep blue sky was an idyllic scene. After spending some time relaxing at the pond, we headed back towards Dzongri. We skirted the eastern side of Dzongri Top hillock to arrive back in Dzongri for a late lunch. At 16:30 the sun set behind the western ridges and it started to get chilly again ( 5°C inside the tent). One of the 'luxury' items I (or rather the pack ponies) carried was a small shortwave radio. It was fun listening to Tibetan pop bands through the fading and static under the cold black sky. We departed Dzongri at 08:45. We headed north and traversed the eastern side of the ridge. The route was basically flat for the next 3 km, though there were ups and downs of a few hundred feet. When we were abeam Kabur, the trail suddenly dropped steeply by a thousand feet. The average slope was 50° and the trail was a gully containing slippery sand and pebbles. Though I had been forewarned about this section in various online blogs, I still managed to slip and nearly dislocated my right knee and left shoulder. At the base of the descent, we arrived at Kokchorung (12,140') on the west bank of the Prek Chu. 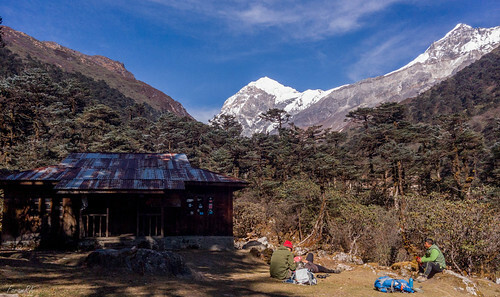 There was a trekkers hut in a small grassy clearing. 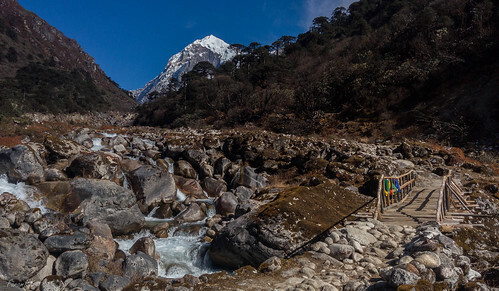 After a break at Kokchorung, we boulder hopped over some slimy boulders and large fallen logs, then crossed over a few small bridges over the slightly braided and fast flowing Prek Chu, to start the climb to Thangsing on the other side of the river. It was a moderate climb traversing a talus slope until we reached Thangsing (12,960') camp site just as evening shadows had enveloped the valley and were rising up the mountain sides. The outside air temperature was 0°C. 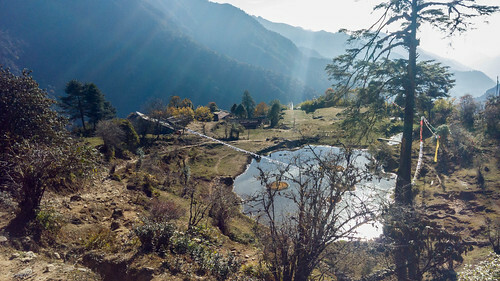 Thangsing is located at the base of the western side of Jopuno (19,400'), in a long flat section of the Prek Chu valley that leads all the way to Goecha La. 'Thang' means 'flat place' or 'place' in Tibetan. There are a couple of trekkers huts. 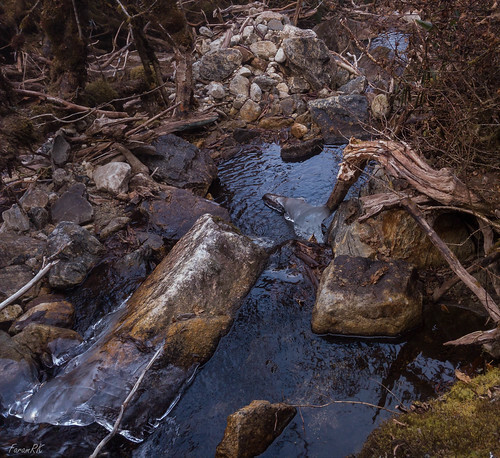 There was a semi-frozen stream that ran across the northern edge of the camp site. 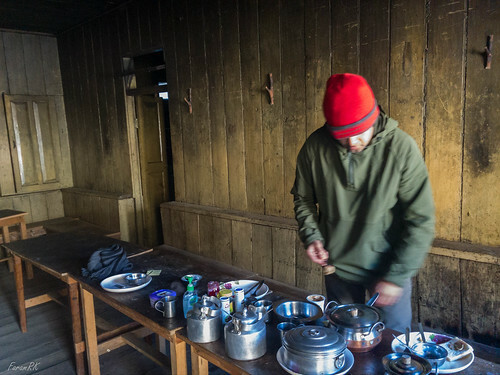 We had dinner inside one of the cold dark huts, under the lights of our headlamps and a portable camp light. After dinner, I set up my camera for a few long exposure night shots with cold hands, then rushed to the warm comfort of my sleeping bag. 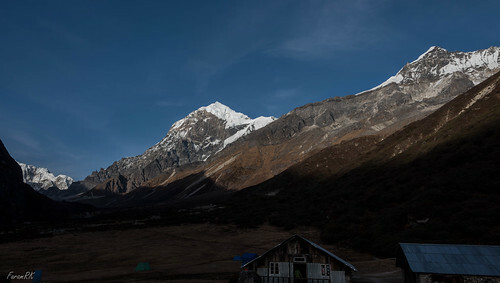 We had decided that Vetal, who had been afflicted with a touch of altitude sickness at Dzongri, would remain in Thangsing, while the rest carried on to the pass. Unfortunately, his condition seemed to have worsened and he had severe headaches which he tried to control by taking painkillers frequently. So we decided to abort the trek and head back the next day. Short of a catclysmic event like an asteroid strike in the Himalayas, we were sure the mountains would be there when we did the trek the next time around! It was another crisp and clear morning ( -5°C outside the tent). I took one last shot of the Prek Chu valley looking north towards the south eastern flank of Kanchenjunga. Then we headed back the way we had come, moving down through the talus to the Prek Chu then crossing it to arrive at Kokchorung. 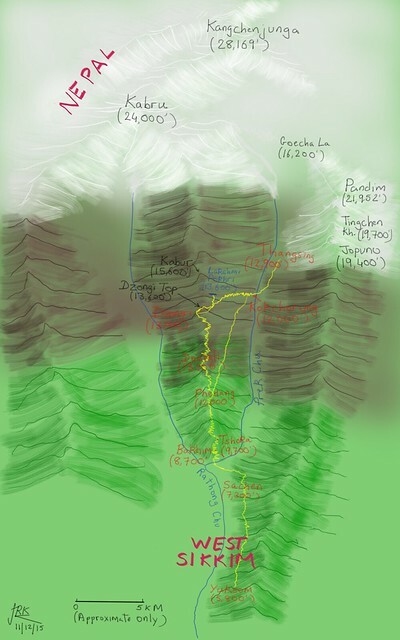 We climbed the trail above Kokchorung for a bit and at the fork, we took the one branching off to the left. This would head directly towards Phedang, bypassing Dzongri. This route traversed the eastern face of the ridge and there was almost no change in net elevation, though there were slight ascents and descents along the trail. 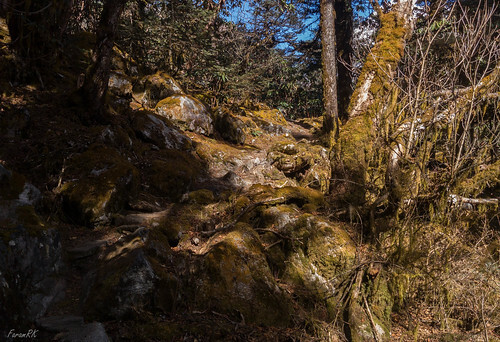 The trail passed through moderately dense jungle with moss covered rocks and tree trunks right out of some sci-fi movie. 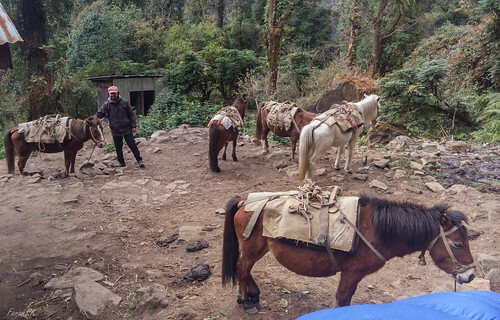 The trail was too narrow for our pack ponies so they would be returning via the Dzongri route. I did not envy their steep one thousand feet climb from Kokchorung. As the sunlight did not much penetrate the canopy, there were sections where the mountain streams had pooled into ice. We could see the fog rising up from the Prek Chu (out of sight far below to the left), and soon we were enveloped by it. This lasted off and on almost all the way to Phedang. Our guide LH was worried by our slow progress and was doubtful about reaching Tshoka before nightfall. So he took off his own jacket and made a sling by tying it with another jacket. Using this to hoist Vetal on to his back, he started moving down the trail at a very fast pace. When he tired, his place was taken by other members of the crew, and so on. It was an extraordinary effort. I would have a hard time carrying a 75 kg man just a few paces at sea level and here was our crew literally running, carrying a man on their back, at very high altitude (elevations above 11,500' are considered very high altitude). I was out of breath trying to keep up with them, carrying just my daypack. We reached Phedang at sunset where we had a tea break. Then it was time to move again, to Tshoka, nearly two and a half thousand feet below. It was quite tricky negotiating the rocky trail in the lights of our headlamps. This time the trail was wide enough for two crew members to carry Vetal down the trail. At last we reached Tshoka at 20:00, having been on the move for 11 hours. It had been a long and tiring day, but the crew had already pitched our tents and soon dinner was served. On awakening, we were surprised to find Vetal up and about, with no headache. The change from the dead-man-walking zombie of the last few days was startling, as if a light bulb had been switched on. These were the effects of descending 3,250 feet the previous day. We decided to take it easy and break the journey to Yuksom into two stages. With the altitude problem sorted out, nobody was in a tearing hurry to get back to the urban jungle. 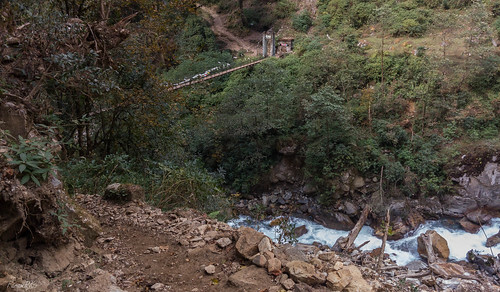 We departed Tshoka after breakfast, passed by Bakhim, and retraced our steps over the Prek Chu bridge. We arrived at Sachen camp site in time for lunch. Later in the day we found the staff working like busy bees in the kitchen hut and on asking them what was on the menu for dinner, they were very evasive in their replies. We had a superb dinner and then were led into the adjoining small room beside the kitchen, all very hush hush. Lo and behold, in the light of our headlamps, there was a big farewell cake, which had been baked by our master chef and his staff! Very touching. Then it was time to retire to our tents for a final night under the stars. 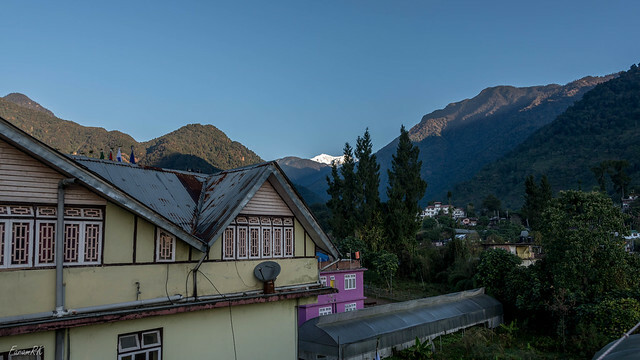 We reached Yuksom in time for lunch, had a comfortable night's rest at our hotel and then departed the next day to rejoin the rat race in our respective corners of the world. I had a Nikon D750 full frame DSLR, 28-300mm zoom lens, an 8mm Fisheye lens and a small tripod. You can read more about this set up in this post. 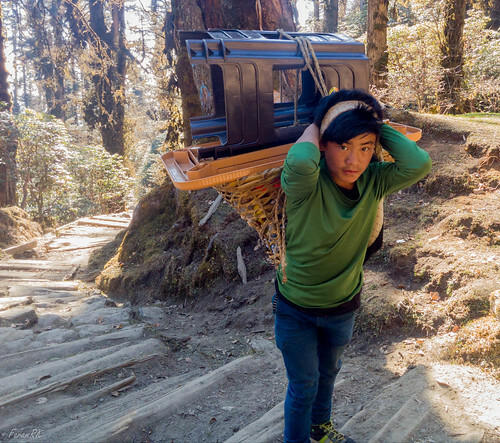 I carried the lot while hiking on Day 1 (Yuksom - Tshoka) and Day 3 (Dzongri day trip). The rest of the days, I took photos with my Nexus 5 camera phone while hiking, and my main photography gear was used in camp. One needs to be reasonably fit to do this trek. The most important is cardio and endurance training followed by a bit of strength and flexibility training. My exercise of choice was walking up the stairs with a loaded pack (18 kg) for an hour each morning. Cross training is also useful, in order to exercise different muscle groups. Running is one of the best cardio exercises, unfortunately I can't do it due to issues with my joints. Going on short hikes to nearby hills also helps. In short, the fitter one is, the more enjoyable will be the trek. AMS is quite a serious condition. The only way to cure it is to stop ascending and/or descend. One way to help prevent it is to ascend slowly, not more than 1,000 vertical feet in sleeping elevation per day, when above 10,000 feet elevation. Everyone in our party were taking Diamox to help aid acclimatization, but that didn't prevent one of us being knocked out due to AMS. Also, just being physically strong is no guarantee against AMS because the one who got hit by it in our group was also the strongest, by far. My SpO2 and pulse reading at various camp sites. In late November, it was warm enough to hike in just a shirt and pants while ascending, due to body heat generated by the exertion. A light fleece/sweater was helpful during periods of less exertion, along with a wind blocker during windy stretches. For camp, one needed warm puffy jackets and/or sweaters. We never used our rain shells because the weather was clear throughout the trek. Also required is a sun hat, warm cap, neck warmer and warm socks.